18th September 2014, the IEEE Student Chapter of Manipal University, Dubai hosted its first event of the semester: an alumni visit from our very own Mr Farzeen Ashraf. Farzeen graduated from the Mechatronics Department earlier this year. In addition to being the Joint Secretary of the IEEE Student Chapter, he represented the college in many Inter College IEEE Competitions during his time as a student. Farzeen had the honor of being selected to represent Manipal Universityt Dubai and the UAE at the IEEE Region 8 Student and Young Professional (SYP) Congress 2014 which was held in Krakow, Poland. 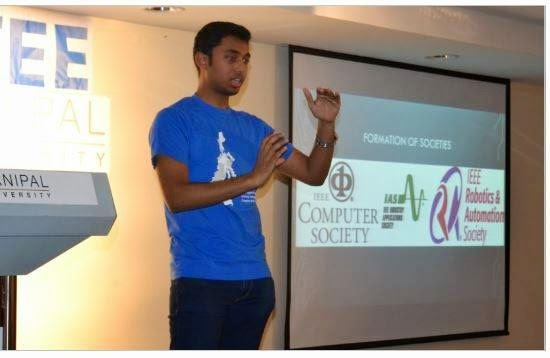 He gave the students of Manipal University a glimpse of what his experience was like by sharing pictures and giving an elaborate presentation about the perks of being a member of the IEEE. Farzeen also highlighted the networking opportunities that become available to students by actively participating and organizing IEEE events. He urged the members of the IEEE Student Chapter to strive to achieve more and connect with their counterparts in other universities so as to gain some perspective and improve their networking skills. Farzeen’s presentation was both enlightening and enthusiastic. It provided a perfect start to the academic year for Manipal IEEE Student Branch.